MIAMI, Fl. 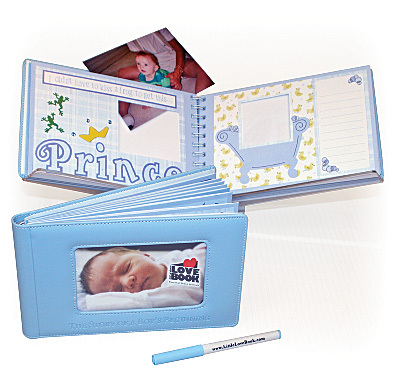 ─ March 9, 2006 ─ The newest product available for busy parents and grandparents who want to capture and cherish their baby’s first year is the “Little Love Book” series of personal photo journals. As an irresistible keepsake, the “Little Love Book” (www.littlelovebook.com) offers the look of a handmade scrapbook with a simple and unique method to slide photos right into the page designs. The first two photo journals in the series are available now and feature a boy or girl’s first year. Each “Little Love Book” contains 20 hand-designed, original themed pages with die cut windows where pictures simply slip in. Every page is made from a heavy cover stock paper that is safe for both digital and traditional photo prints. The stitched and softly padded leatherette cover also features a window to add a photo. This distinctive design means each book can be put together in less than an hour, without any hassle or mess. The “Little Love Books” also include acid and lignin-free double-sided adhesive to secure photos and an archival quality pen for journaling alongside the images. It is the perfect shower, Mother’s Day, new parent or grandparent gift. At an attractive MSRP of only $24.95, the “Little Love Books” are priced to appeal to anyone looking for a personal and memorable gift. The “Little Love Books” are currently available in both a boy’s and girl’s version. More books will be added to the collection in 2006 focusing on love, celebrations, traveling and more. For more information or wholesale and retail opportunities visit www.littlelovebook.com or call (888) 697-8892. Recognized as an avid scrapbooking and memorabilia enthusiast for over a decade, Lisa Lee is the co-founder and CEO of “The LisaLee Company”. As an expert on the tools, techniques and people in today’s multibillion-dollar scrapbooking industry, Lee is the driving creative force behind the company and draws upon her decade of hands-on experience crafting handmade albums for her family and others.